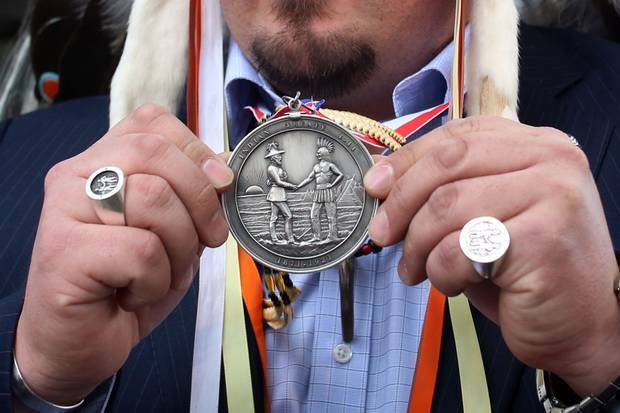 Ottawa, 2013: At a protest on Parliament Hill, Grand Chief Derek Nepinak of the Assembly of Manitoba Chiefs displays a seal commemorating a treaty between Indigenous people and the Crown. In 2012 and 2013, the Idle No More movement’s emergence drew renewed attention to Indigenous nationhood and treaty rights in Canada. Neo-liberalism and capitalist political movements – often called "development" – always come at the cost of Indigenous nations and citizens. In the great march towards free trade, "open" borders, and "first-world" status, Indigenous nations fight for lives and futures against global superpowers, stubbornly maintaining sovereignties and stewardships while refusing to acquiesce to erasure and death. 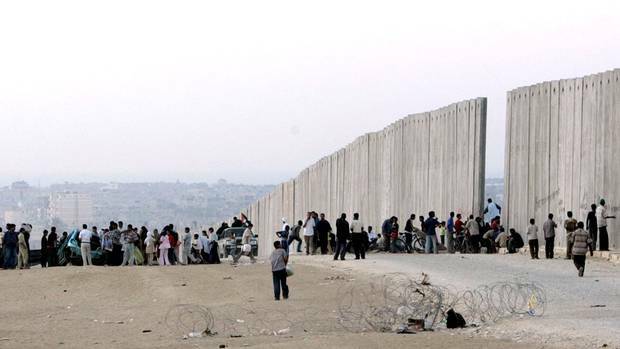 We can see this struggle nearly every day in "ethnic battles" in the Americas to the Middle East. At the base of these wars is control over territories and resources. "It is no wonder," Victoria Tauli-Corpuz remarks in Paradigm Wars: Indigenous Peoples Resistance to Globalization, "that rapidly increasing so-called ethnic conflicts in the world are really pitting Indigenous peoples, asserting our rights over our territories, against the global institutions that want to separate us from our land" The solution is simple. Attempts to homogenize, consume, and destroy Indigenous nations must stop. We must be recognized for what we are: different and diverse. It may just be that Indigenous nations have answers to nearly every single challenge facing nation-states and leading to such wars today. In fact, it may just be that the problem is the nation-state structure itself. 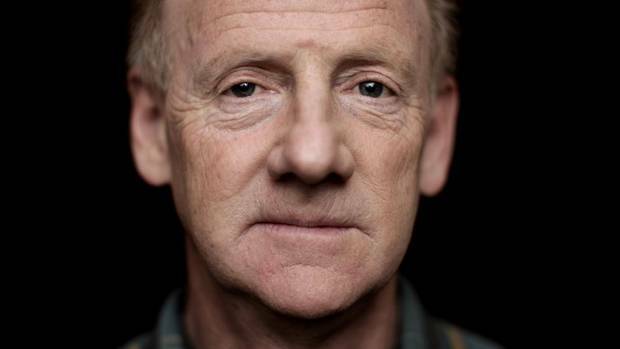 As my colleague John Ralston Saul convincingly argued in an article in last week's Globe: what drives European-based nation-states is a delusional sense of racial, cultural, and social uniformity and sameness that always ends in violence and genocide. Humans simply aren't meant to be so reduced. Indigenous nations pose a tremendous threat to the Westphalian nation-state ideal that Europe has forced the rest of the world to swallow. Oddly, we are not that far off from the historical ideas Europeans had of nation. French philosopher Ernest Renan, for example, in 1882 referred to nationhood as "a soul, a spiritual principle," not only held in common families, language, religion, and "interests," but in shared geography and a "consciousness" amongst its members that includes "a rich legacy of memories … the desire to live together, the will to perpetuate the value of the heritage that one has received in an undivided form." Historian Benedict Anderson, in his book Imagined Communities: Reflections on the Origin and Spread of Nationalism, would later add to this saying that nationhood was based on narratives citizens share, including history, identity, and experience – an "imagined political community – and imagined as both inherently limited and sovereign." 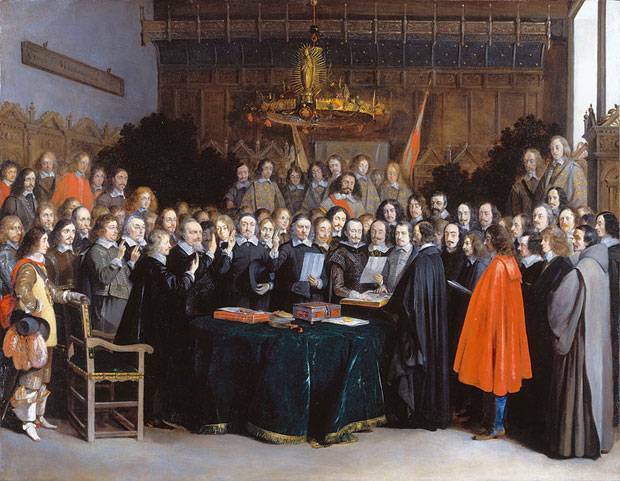 The historical basis of nationhood wasn't meant to reduce complexity, but celebrate it. But then came industrialization and the insatiable hunger for lands, resources, profit, and money. Greed. Theft. Protectionism. This is mine and this isn't yours. An evolutionary model of human community was invented, starting with the "tribe" or some other savagery and ending with the great Westphalian nation-state and notions of sovereignty and separatism. Finally came "fixed" borders with men with automatic weapons guarding them. Now we have pathetic little screaming racist men marching in cities with department-store torches killing people in the name of patriotism and building as many walls as possible. 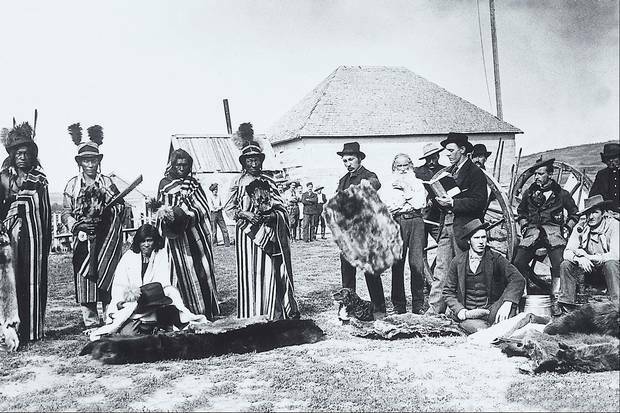 Fort Pitt, NWT, 1884: Plains Cree chief Big Bear and his sons trade with European settlers. Cree and other Indigenous concepts of nationhood were rooted in kinship relationships that clashed with traditional Western ideas about sovereignty. 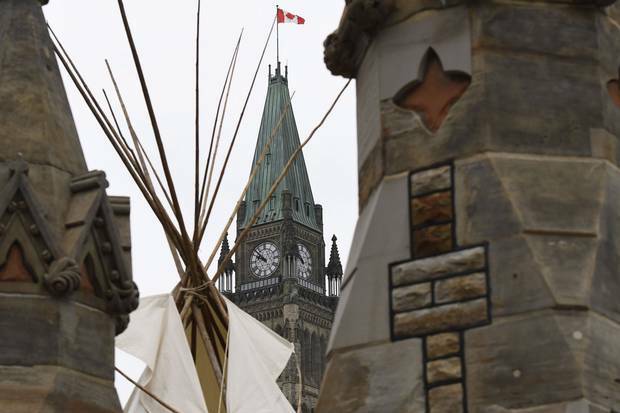 Ottawa, 2017: A large teepee, erected by Indigenous demonstrators to kick off a four-day Canada Day protest, stands in front of Parliament Hill in Ottawa. This necessarily involved immigration. People didn't just marry into one another's families but children were shared if the need arose. This was particularly how peace was forged if a war had just completed. This sometimes meant children lived with parents not their own but not always. Sometimes a son or daughter had to fulfill the lifelong role and duty of a son or daughter who was lost. This was what restorations and reparations looked like in an Indigenous world. We might even call that reconciliation. Settlers to these lands now called Canada have had such a hard time understanding the value of this perspective on kinship. Instead, is manifested as a patriotic, flag-waving malaise sung at sporting events where undying, uncritical loyalty is stomped into psyches and worn as a badge of honour. Kinship is more than simply that. It's the idea that citizenship is a responsibility. The land is a responsibility. History is a responsibility. Life is a responsibility. Even rights only hold value in responsibility. Law is built on these responsibilities. The most important responsibility in Indigenous nationhood – the principle that underlies most ceremonies, songs, and stories – is the importance of fostering more life. This doesn't mean that conflicts, fights, and criticism don't happen – for life needs reminding once in a while, too. An interconnected world after all has a responsibility to each other in its ongoing makeup. Nowadays some Indigenous scholars describe Indigenous nationhood as a sense of "peoplehood," "matrix," made up by "four factors" – a shared language, sacred history, ceremonial cycle, and place, or territory. This encompasses much of the forms of kinship we carry in our lives but "peoplehood" doesn't carry the same gravitas as "nation" – especially on the world stage. 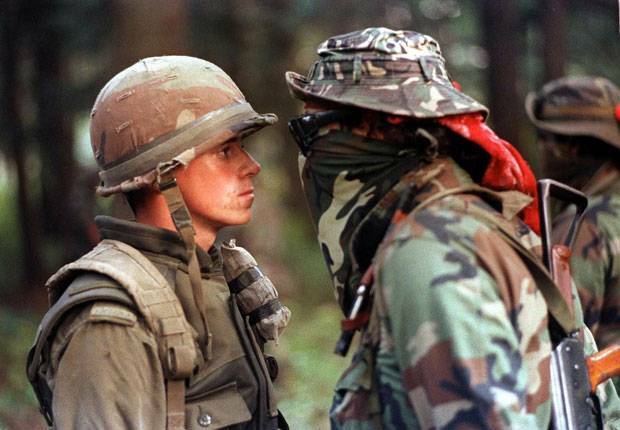 Indigenous nationhood simply won't go away. While the 1783 Treaty of Paris may have plopped a great border along the 49th parallel and attempted to divide thousands of Indigenous nations, our nationhoods have endured. For my people, the Anishinaabeg, we travel to ceremonies in what's now known as Wisconsin and visit relatives in Ontario, returning home to Manitoba. It's all Anishinaabeg territory to me, even if the men with guns at the border don't think so. In political events we take time as Anishinaabeg to greet everyone and make sure we know where everyone is from, who they represent and how, and how their responsibilities have brought them to this place. Then we discuss. We argue. We agree. Sometimes we make declarations, laws, and new boundaries and borders. Sometimes we do this in books or on Skype. It's 2017, after all. It's the same way with my family. We have adopted new members into our family. Some aren't even genealogically Anishinaabeg. They are part of us now. Some of them are better at doing Anishinaabeg things then I am. Okay, most of them. They remind me of this. This is not to deny that Indigenous thinkers have not pondered the relevancy of certain manifestations of the Westphalian nation-state. "Using the master's tools" – to use a much quoted phrase – can be an attractive, insurgent, and anti-colonial move. In his 1975 treatise Prison of Grass: Canada From a Native Point of View, for example, Métis activist Howard Adams describes such a vision. More recently Indigenous scholars like Taiaike Alfred, Patricia Monture-Angus or James Sakej Henderson have grappled with this issue as well. The United Nations Declaration on the Rights of Indigenous Peoples even includes Article 3, a clause that allows for statehood (and other forms of national governance, for that matter). While these incarnations of the nation-state are intriguing, it is more likely that Indigenous activists, intellectuals, and citizens adopt Audre Lorde's principle that "the master's tools will never dismantle the master's house." In other words, the inherent structure, institutional violence, and values embedded in the Westphalian nation-state likely make it untenable for Indigenous notions of kinship. 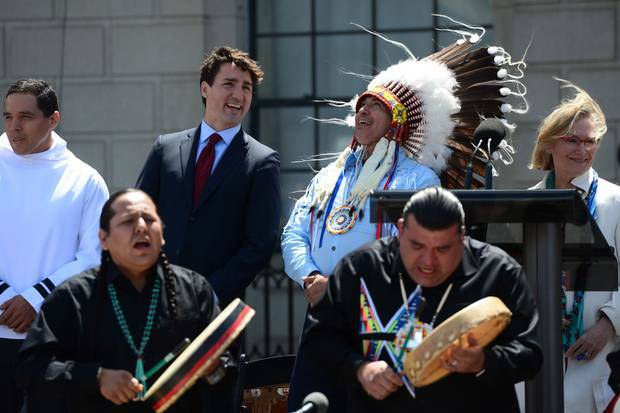 Ottawa, 2017: Prime Minister Justin Trudeau and Perry Perry Bellegarde, national chief of the Assembly of First Nations, celebrate National Indigenous Peoples Day. One needs to look no further than Canada to see how Indigenous nations tend to be coerced, ignored, and denied. While the most recent incarnation of Canadian government makes declarations that a new "nation-to-nation" relationship exists, it continues to make unilateral declarations without warning or consultation. The recent split of Indigenous and Northern Affairs into two bodies came out of virtually nowhere yet this is the primary body First Nations must encounter to deal with the Crown. That's not a relationship, that's a proclamation. Britain has been declaring to us where and how we will live since 1763 and this week's events continue to perpetuate that same cycle. This has not meant that Indigenous nationhood has been abandoned, however – far from it. As if returning to an ongoing abusive relationship, Indigenous nations return to tables and legislatures, to courtrooms and conference rooms, to living rooms and church basements trying to explain to Canadians how our nations work and the parameters peace can be forged. The message, over and over again, is that it's a relationships between actual, real, equals. In relationship with everyone else (don't forget the non-humans!). We tell this to immigrants too. When many of us heard that we were inheriting thousands of Syrians we flocked to airports to welcome them with song and gifts. Many of us have joined committees, visited Mosques, and edited citizenship guides to ensure our new relatives can orientate themselves properly here and know they are home. Most of us have found new connections. I am proud to have an Islamic brother now, and an Aunty and Uncle. We don't pray the same way, nor do we speak the same language, but we have many responsibilities we share with one another. One is to march against hate together. The other is to watch each other's children. Another is to share food. If we wait for Canada to recognize Indigenous nations for what we are we will likely be waiting forever. We are also headed for conflicts and wars – much of which we have only seen glimpses at in places like Oka in Quebec and Elsipogtog in New Brunswick – if this nation continues its march towards resource exploitation, pipelines, and same neoliberal agenda the world is headed. Right now most of our fights are in courtrooms but they won't be there much longer. The land is calling for more. Indigenous nations did not disappear the day after Columbus, Cartier, or whichever random European got lost and found their way west. As Jace Weaver states in his co-written book American Indian Literary Nationalism: "'Self-determination' and 'nation' are equally 'foreign' concepts. And they are equally indigenous." Whether called a sense of "peoplehood" or a "nation," we refuse to acquiesce, disappear, or be denied. Among infinite examples, look at the Idle No More movement, which has introduced thousands of Indigenous young people to the Canadian public. I used to be one of them (maybe I still am?). In each and every case these brilliant, savvy, and articulate young people are talking about Indigenous resurgence, presence, and home nations in ways that inspire, startle, and devise a future in which they are a central and responsible relation in some way with you. They certainly don't have to. Most come from communities that endure incredible violence, suicide, and experience tremendous challenges. Not many would blame those who have experienced violence to return violence. Editor’s note: An earlier version of this story referred to the Idle No More movement in the past tense.